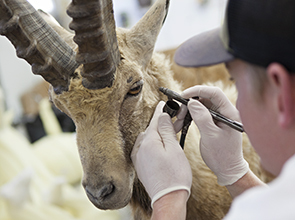 We can’t stress enough how essential field care is to creating a great taxidermy mount. This is sometimes the most overlooked part of the process. We want to help you be prepared before your hunt so you can enjoy the memories long after! By handling your animal properly in the field, you can help prevent common issues such as hair slippage, holes, not enough cape, irreversible damage, or even worse, losing your cape to bacteria or heat damage. Download our complete Field Care Guide, and please do not hesitate to call us if you have additional questions. Once we receive your trophies, we inventory all items and inspect them for bug damage, hair slippage, etc., and notify you of the condition of each item. 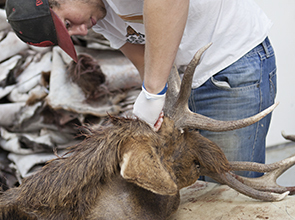 Understanding the condition of your trophy is important in the tanning and skinning process and also allows us to highlight certain aspects of the animal that you might like. Next we consult with you to discuss your trophy and pose instructions either through email, phone, or face-to-face. This is where we start to generate ideas on poses and concepts. 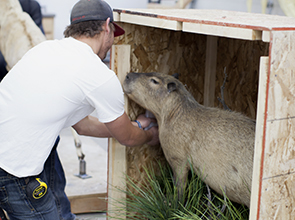 We will also discuss habitat options, pedestal options, and ways to design and create a truly unique piece. 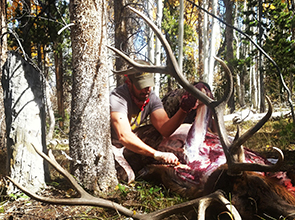 Several things occur prior to tanning your trophy including, skinning, fleshing, salting, and preparing capes for tanning. After capes are prepped, we begin the tanning process. This is one of the most important stages of the process. We utilize the best tanning services to ensure your trophy is well cared for. This stage of the process is where your piece comes to life. This is the most time-consuming and longest stage of the process. Commercial forms are only the beginning. We cut, size, and reshape the form to fit the size of your animal and cape. At this stage we begin to develop the pose and construct muscle detail, facial features, and expressions. Posture, anatomy, expression, and pose are all vital elements of each piece. We can e-mail photos upon request to make sure the pose is to your liking. The form is test-fitted several times to ensure your cape properly fits and the size and pose are correct. We pay close attention to detail and continue to make adjustments throughout this process. Once the cape is secured to the form, we begin the fine-tuning process. Habitat can really add a dynamic effect to your piece. Whether it’s a stream, pond, or the addition of sagebrush or desert grass, we create a realistic and natural habitat setting for your piece to make it really stand out. All habitat is individually constructed; trees are built, rocks, and water are created to really enhance your trophy. 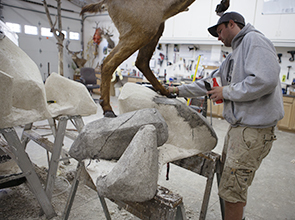 Each base and pedestal is created to balance and compliment your trophy. Don’t have room for a base in your home? Not a problem…we can create a wall or floor pedestal for your trophy that encompasses habitat elements to make your piece stand out without taking up extra room. The final stage of the design process is finishing and retouching. 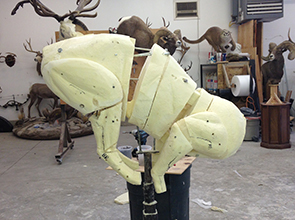 This includes adding putty around horns, eyes, and nose to create a seamless finish. We touch up color, add wetness to the nose and eyes, clean, groom, and inspect your piece. 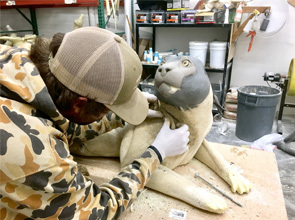 Once your trophy is completely dry, retouched, and finished, we will contact you to discuss delivery and shipping options. We offer shipping and crating services to worldwide destinations. You are always welcome to pick up your piece directly from the studio as well.